Note: Many years before Barrett and Struthers worked together, Clarice Blackburn shared the stage with another "Bunker." She and Jean Stapelton (Edith on All in the Family) costarred in an off-Broadway hit in the 1950s. Click here to read about that. 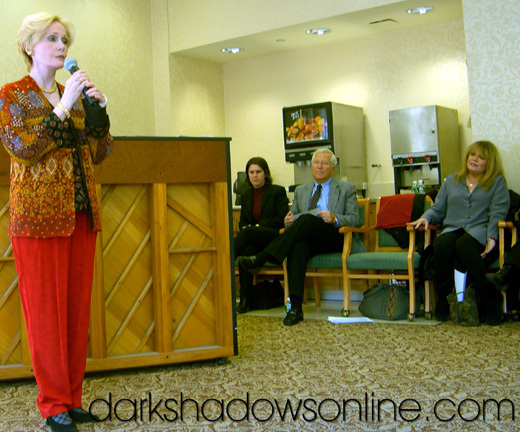 To get some practice in front of audiences, Nancy Barrett occasionally performs at NYC hospitals and senior centers, entertaining residents with songs from her various cabaret shows. And as her producer, if I'm available I like to attend and offer Nancy feedback. 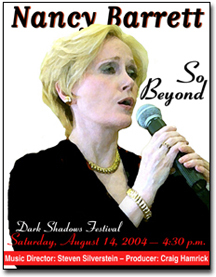 In March 2004, while we were in the process of preparing the show she would later debut at that year's Dark Shadows Festival, Tarrytown, NY, I got a bit of a surprise when I showed up at one of her senior-center shows. One of the other volunteers performing that day looked pretty familiar. 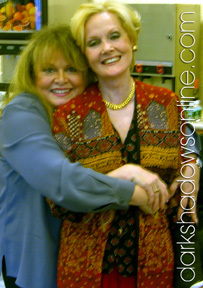 It turned out former All in the Family star Sally Struthers was making a surprise appearance. The event was part of a program called VocalEase: Songs From the Heart, which is a volunteer singing organization whose members perform at hospitals, nursing homes and senior centers. Steven Silverstein, Nancy's musical director, was the pianist for the afternoon show. A moment later Nancy mouthed a message to me: "No pictures," as she pointed at Sally.... I'm not sure why she didn't want her photo taken while she sang, but I of course obliged. But then, as soon as the show was over, Sally grabbed a hold of Nancy (who she'd never met before that day) and started mugging for my camera. I guess she didn't mind being photographed; she just wanted to be able to pose. Nancy, who was wearing a cast on her forearm following a recent surgery, sang several songs including Irving Berlin's "I Love a Piano" and a humorous ditty about a woman with a speech impediment, called "Cla-wence." 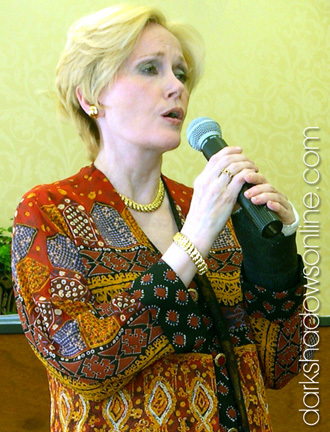 Sally did a few songs, including "Before the Parade Passes By," which she said she'd performed in a touring production of Hello, Dolly a few years prior. The group of six singers performed "Lullaby of Broadway" together at the conclusion of the show. Steven Silverstein, Sally Struthers, and Nancy Barrett after a performance in March. 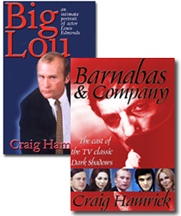 For information about the cast of Dark Shadows, check out the book Barnabas and Company, available at Amazon.com. See a gallery of photos from Nancy's personal collection.